Tonight I was blessed to be able to bathe, clothe, and tuck three little boys into bed instead of two. I turned down their beds, gathered their pajamas, and found their blankets…. Trevin and Easton were beyond excited to help me with Cohen’s bath. Trevin gathered the soap, washcloth, and the soft brush while Easton picked out his pajamas. With four extra hands helping me bathe Cohen, it seemed a little stressful, but I enjoyed every minute of it. I could see the excitement on the boys’ face being able to help as well as finally have their brother home. By the end of the bath, Easton was really tired and drifted off to sleep on the couch. Colby took him to bed and tucked him in for the night. Trevin explained that he needed to sleep in our room so that he could help Cohen if he woke up in the night. After talking to Trevin for about twenty minutes, I realized I wasn’t going to be able to convince him to sleep in his own bed. He said, “Mom. You need your sleep too. I will wake up with Cohen so you can sleep in the night.” My heart melted. We laid some blankets on our bed and let him drift off to sleep there. 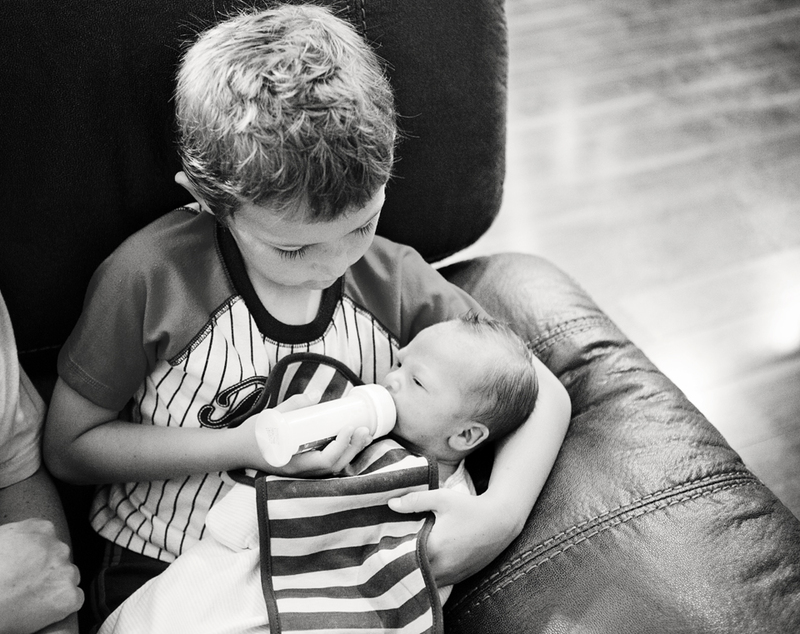 He is bound and determined to be the best brother in the world! On a more personal note, tonight I couldn’t be more grateful and thankful to my Heavenly Father for blessing me with three beautiful healthy little boys. After seeing some family members go through some very hard times trying to have children of their own, I know I am extremely blessed to have the children I have and to be trusted in raising them/teaching them the way my Heavenly Father would want me to. They say three children is a HUGE challenge, yet I am excited for the challenges we will face. As far as tonight goes, life is wonderful, and I am extremely blessed with three instead of two!